We have a dozen or so orange traffic cones on the playground, a collection we've had for over a decade. Predating those larger cones were a set of smaller red cones that a prior teacher purchased from a school supply catalog. I've been living with those small red cones for as long as I've been teaching. There were originally six of them, kept tidily on a shelf. I don't know how many we have now -- I'm guessing two or three -- and they're just kept out there where the kids leave them at the end of the day, part of the junkyard chic. Last week, Solie ran up to me with one of the red cones as I sat on a table near the top of the playground space. "Teacher Tom, put this by your ear." He showed me how to do it, inserting the small end (which has broken off over the years) into his ear, leaving the open end toward the world. "Now aim it at me." I did as instructed, turning the open end his way. He then ran halfway across the space, turned, and spoke in his normal speaking voice, "Hey Teacher Tom, can you hear me?" I could! The cone allowed me to hear him quite clearly. Not only that, but I could even make out what the kids were saying all the way down at the workbench, which was twice as far away. I said, "It's a spy thing!" Solie answered, "I is!" then ran off to his play. 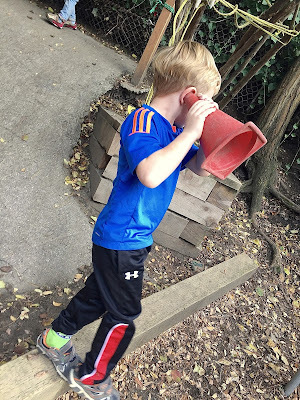 Without even thinking about what I was doing, I shared this discovery with the kids near me, using more or less the same words that Solie had used, "Put this by your ear," "Now aim it at me," then they, in turn, showed it to other kids. It was only later that I recognized that I'd been part of a chain of "viral learning." I don't know if Solie had figured it out for himself or if someone had shown him, but what I do know is that once I had been exposed to his "discovery," I couldn't help myself: I made it my own and spontaneously paid it forward to whoever would listen, who likewise couldn't help sharing it with others. For most of human evolution, this is how learning has worked. Someone discovers cool or useful stuff, then it gets passed on from excited discoverer to excited discoverer until it's common knowledge. Sadly, the potential for this kind of viral learning has been squeezed out of modern schools in their quest for top-down, adult controlled education. Indeed, children are often punished for sharing what they know with their classmates. It's called cheating. We command kids "Do your own work," and "Eyes on your own paper," and "Keep your hands to yourself." It's as if we've intentionally tried to make learning as difficult as possible by removing one of the most important educational instincts: the urge to tell others about our cool or useful discoveries. This is why we must at learn fight hard for more and longer recesses. For many school children, that's the only time that this sort of viral learning takes place. Humans are clearly designed to share what we know with those around us. Most of us can't help ourselves. For the rest of the day, kids were experimenting with those cones. Some tried holding up two or even three cones in succession under the theory that if one was good, more would be better. Others tried looking through them. One girl even wondered if the cone could enhance her sense of smell. And then someone figured out that if he shouted into the narrow end, it amplified and directed his voice. Within minutes every one of his classmates knew it as well. "So Everyone Thinks They're Just Fine"
"May I Play With You?"